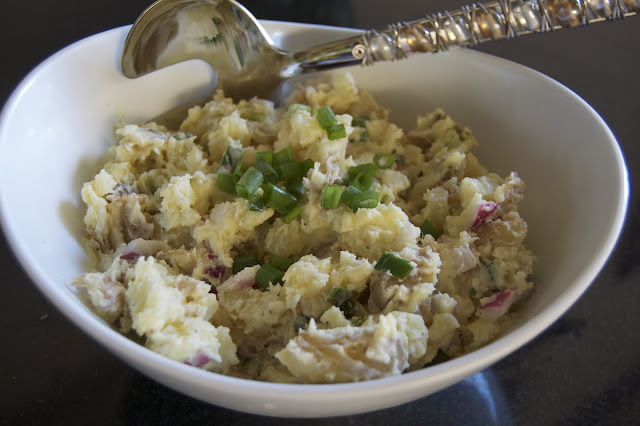 Potato Salad - a favorite summer side often seen at BBQ's. However, usually the farthest from my mind as something to make. 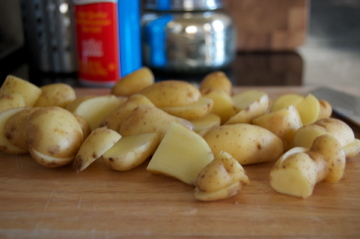 But a small bag of fingerlings sitting in the fridge and a hankering for winter-y mashed potatoes, they were born! I never, repeat ever, grab these from the side table, mostly because they have always tasted too much like the mass-market super market kind so often served. That bad notion of what potato salad tastes like may have scared me! hehe.... And then add in the egg factor - no a big egg fan - and chunks in my 'salad' equal no beueno. While boiling, chop 1/4 red onion, 3 green onions. When potatoes are done drain and put into fridge to cool off. 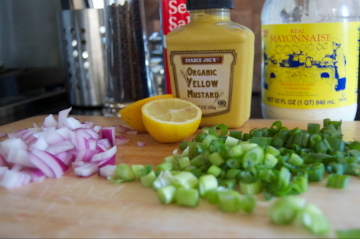 Once cool, add roughly 1/4c mayo (3 big spoonfuls), about 2 tablespoons yellow mustard (2 good squeezes), the juice of one small lemon, and then mix in chopped onions. Garnish with a sprinkle of chopped green onions. The lemon juice really brighten's the dish up and makes it taste fresh and perfect for summer!!!! Keep in refrigerator until ready to serve - best cold, in my opinion! When ready, take out and enjoy! Perfect Taylor. We are heading to a cottage next week and I am collecting some recipe ideas. Thanks! mmmm yum! looks so tasty! perfect for summer. 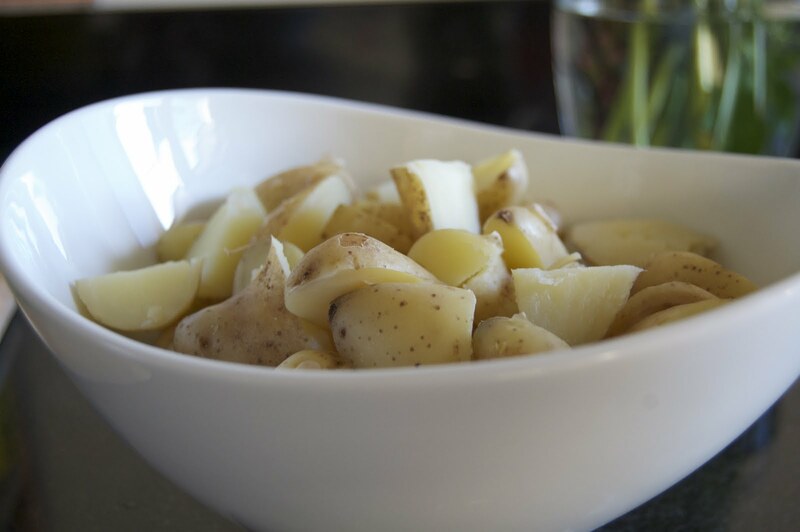 xoxo jillian:: don't miss my fishs eddy dish giveaway! 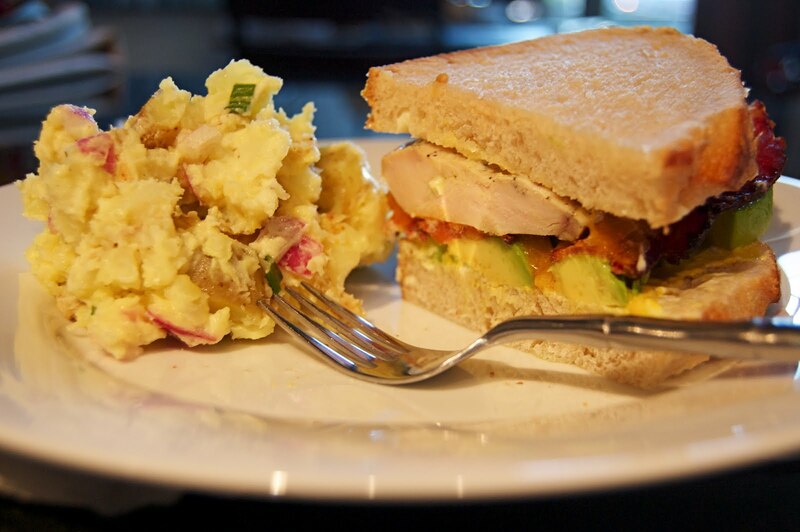 mmmmmmmmmm, i loove potato salad. this looks awesome! YUMM! That loook amazing lady!! Looks yummy! So great to meet you and check out your blog, drinks again soon! potato salad! my favorite! that looks so good! I usually don't like the store bought potato salads but I'll definitely try making this one! It looks so yummy! 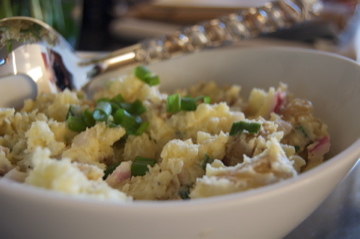 Ok, so green onions are what's missing from my potato salad! I'll have to remember the lemon juice tip. You're speaking my language--this looks so good! DUDE. This looks so freakin' delicious.